I do not know what dust is. I do not know where it comes from. I only know that it settles on things. I cannot see it in the air or watch it fall. But I never see it sliding about looking for a place to rest when my back is turned. Does it wait ’til I go out? Or does it happen in the night when I go to sleep? Though it seems to prefer still objects. Sometimes, out of kindness, I let it lie for weeks. It will always return in a friendly way. Over the rest of last year, the BICEP2 team collaborated with the consortium working on the Planck satellite, which has measurements over the whole sky at a wide range of frequencies. Of particular relevance to the BICEP2 controversy are the Planck mesurements at such high frequency that they are known to be dominated by dust emission, specifically the 353 GHz channel. Cross-correlating these data with the BICEP2 measurements (and also data from the Keck Array which is run by the same team) should allow the identification of that part of the BICEP2 signal that is due to dust emission to be isolated and subtracted. What’s left would be the bit that’s interesting for cosmology. This is the work that has been going on, the results of which will officially hit the arXiv next week. 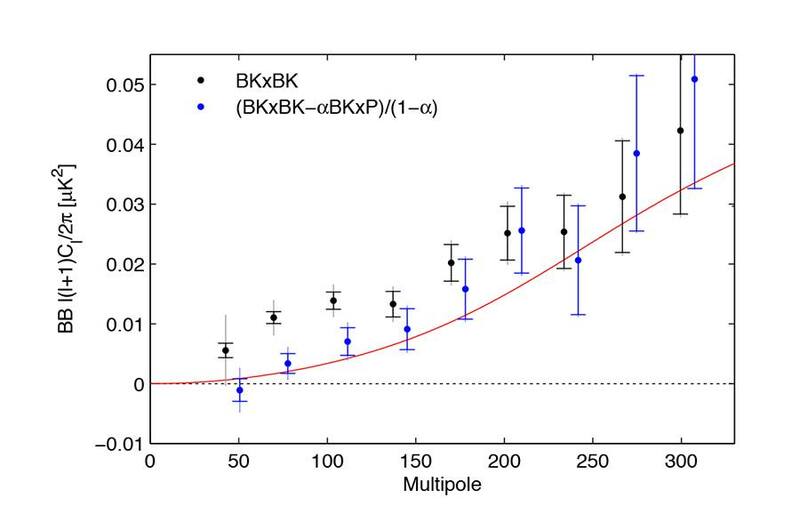 The black dots with error bars show the original BICEP/Keck “detection” of B-mode polarization which they assumed was due to primordial gravitational waves. The blue dots with error bars show the results after subtracting the correlated dust component. There is clearly a detection of B-mode polarization. However, the red curve shows the B-mode polarization that’s expected to be generated not by primordial gravitational waves but by gravitational lensing; this signal is already known. There’s a slight hint of an excess over the red curve at multipoles of order 200, but it is not statistically significant. Note that the error bars are larger when proper uncertainties are folded in. To be blunt, therefore, the BICEP2 measurement is a null result for primordial gravitational waves. It’s by no means a proof that there are no gravitational waves at all, but it isn’t a detection. In fact, for the experts, the upper limit on the tensor-to-scalar ratio R from this analysis is R<0.13 at 95% confidences there’s actually till room for a sizeable contribution from gravitational waves, but we haven’t found it yet. UPDATE: As noted below in the comments, the actual paper has now been posted online here along with supplementary materials. I’m not surprised as the cat is already well and truly out of the bag, with considerable press interest, some of it driving traffic here! UPDATE TO THE UPDATE: There’s a news item in Physics World and another in Nature News about this, both with comments from me and others. One of the advantages of informal workshops like this one I’m attending in Copenhagen right now is that there’s a lot of time for discussions and picking up various bits of gossip. Some of the intelligence gathered in this way is unreliable but often it represents knowledge that’s widely known in the cosmological community but which I’ve missed because I don’t spend as much time on the conference circuit these days. Anyway, those of you with more than a passing interest in cosmology will remember the results from the BICEP2 experiment announced with a great fanfare of publicity in March this year. A significant number of eminent cosmologists immediately seized on the detection of B-mode correlations in the polarized cosmic microwave background as definitive proof of the existence of primordial gravitational waves. 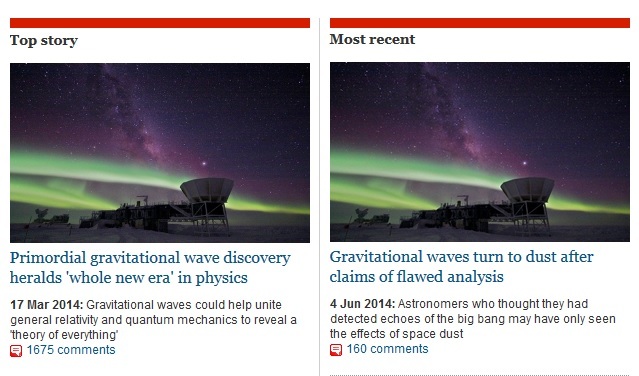 Some went even further, in fact, and claimed that the BICEP2 results prove all kinds of other things too. As time passed, however, and folks had time to digest some of the details presented by the BICEP2 team, there has been a growing unease about the possibility that the measurements may have been misinterpreted. The problem – the Achilles Heel of BICEP, so to speak – is that it operates at a single frequency, 150 GHz. That means that it is not possible for this experiment on its own to determine the spectrum of the detected signal. This is important because it is not only the cosmic microwave background that is capable of producing polarized radiation at a frequency of 150 GHz, foreground dust inside our own Galaxy being the prime suspect as an alternative source. It should be possible to distinguish between dust and CMB using measurements at different frequencies because the microwave background has a black-body spectrum whereas dust does not. However, BICEP2 maps only a small part of the sky and at the time of the announcement there were no other measurements covering the same region, so a convincing test has not so far been possible. The initial BICEP2 announcement included a discussion of foregrounds that concluded that these were expected to be much lower than their detected signal in the area mapped, but serious doubts have emerged about the accuracy of this claim. Have a look at my BICEP2 folder to see more discussion. More recently, in July, it was announced that the BICEP2 team would collaborate with the large consortium working on the analysis of data from the Planck experiment to try to resolve these difficulties. Planck not only covers the whole sky but also has detectors making measurements over a wide range of frequencies (all the way up to 857 GHz). This should provide a definitive measurement of the contribution of Galactic dust to the BICEP2 field and at last give us a strong experimental basis on which to decided whether the BICEP2 signal is primordial or not. The result of my informal poll on BICEP2 was a clear majority (~62%) in favour of the statement that it was “too early to say” what the BICEP2 signal actually represents. Anyway, I have it on very good authority that Planck’s analysis of the Galactic foregrounds in the BICEP2 region will be published (on the arXiv) on or around September 1st 2014. That’s just about 10 days from now. Maybe then this tantalizing wait will be over. I’ll try my best to post about the results when it comes out. In the meantime, I thought I’d do something completely unscientific and try to gauge what how current opinion stands on this issue by means of a poll of the total unrepresentative readership of this blog. Suppose you had to bet on whether the BICEP2 result is due to (a) primordial gravitational waves or (b) Galactic foregrounds, which would you go for? Of course, those working on this project probably know the answer already so they’ll have to decide for themselves whether they wish to vote!